Me with my late studio partner, Maximus. I am a life-long Michigan resident and a fine artist with a special passion for nature and wildlife. My early career was as a graphic artist, technical illustrator, CAD designer, and as an industrial designer. More recently, I taught art classes at Wayne County Community College in my local area. Today my life is dedicated to making art and taking care of family. I have been married to my childhood sweetheart for over 40 years and am proud to have two adult sons who both exhibit creative abilities in their chosen careers! Images on the right: (top) I have sailed on the tall ship, “Friends Good Will” on Lake Michigan near South Haven. 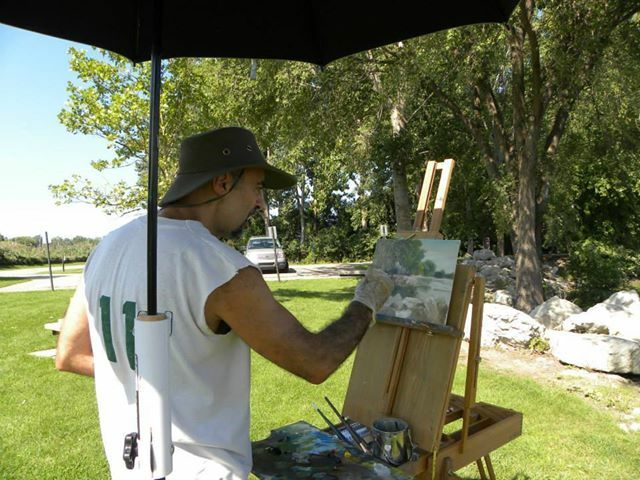 (second from top) This is one of my plein air excursions at Lake Erie Metro Park. (second from bottom) Once in a while I will do a show such as this one in Chelsea, Michigan and I look for galleries to exhibit in. (bottom) I had the honor of visiting and painting with Heiner Hertling, a renowned wildlife artist, at his beautiful studio in Michigan. The focus of my art work is primarily subjects dealing with the Michigan Great Lakes scene, fresh water, environmental issues, and wildlife. Since I love animals, I do many pet portraits too!